Benalmadena is located next to the famous beach town of Torremolinos, in the province of Malaga on the Costa del Sol, at only 20 minutes' taxi ride from Malaga Airport. 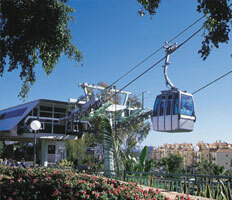 The municipality of Benalmadena consists of three districts: Benalmadena Pueblo, Benalmadena Costa and Arroyo de la Miel. 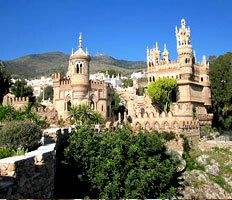 Benalmadena Pueblo (village) is located 4 km inland at a height of 300m above sea level. The foundation of the town itself dates from the 15th century, is the oldest part of Benalmadena and still retains its old structure of white houses and narrow streets. 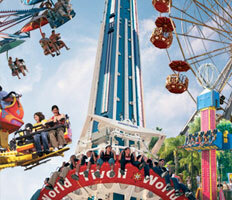 Tivoli World: a fantastic amusement park. Cable car: which whisks passengers up to the Sierra from where you can enjoy stunning views over the coast and the Mediterranean beyond. Ice skating: Benalmadena has its own ice rink. And of course the town's spacious and clean beaches. Puerto Marina: a luxury port with shops, restaurants, bars and nightlife. Torrequebrada Watch Tower: the so-called 'Broken Tower' dates back to the 15th century. 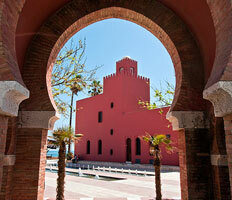 Bil-bil Castle: a dramatically situated faux Moorish structure that's now a cultural centre. Flea Market: every Wednesday in the fairground. Parque la Paloma: perfect for peaceful evening strolls. 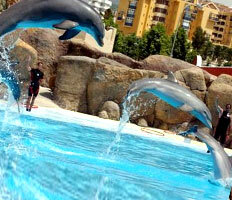 Like the sound of Benalmadena and planning a visit? Find out more about the cheap airport transfers to Benalmadena we offer here. It’s simply the most convenient way to start your holiday off. 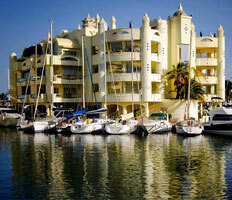 Benalmadena is near various other places that are worth a visit, such as: Marbella, Mijas, Fuengirola, Torremolinos, etc.